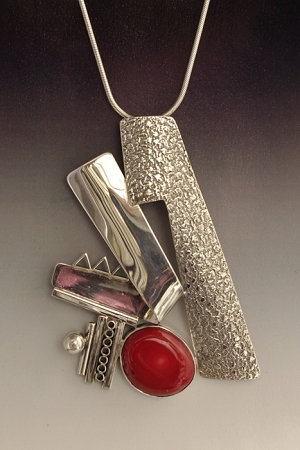 Collage Jewelry - This is a bold handcrafted contrast high polished and texture sterling silver pendant featuring a freeform red Coral. This abstract One-of-a-Kind statement necklace comes with an 18" sterling silver snake chain. Sterling silver abstract pendant consisting of textured silver and shiny silver with accents of silver tubing. This modern design is complemented by red coral (polished natural shape). The pendant includes an 18" sterling silver snake chain.Designed, signed, and hand made by Aaron Rubinstein and Modern Art Jewelry .